With an irresistible and appealing "cute" style and a penchant for canon-focused art, kati-kopa has drawn a lot of attention to herself in the past year of her membership here at the TLKFAA—and her numerous fans have voted to give her the recognition she deserves and the honor of our monthly spotlight. The Lionking - "the infinite universe"! When I think when all that has begun, it surprises me over and over again what a wave one single film can cause. And somehow it makes me sad that some children don't even know about TLK anymore! (really!). However, it's also a fact that without the internet you can hardly find something out about these lions. I myself have discovered Kopa and Mheetu just 2 years ago. I also often get asked by friends who the both actually are. It's really astonishingly how much the Internet and the "hidden secrets" from The Lionking have in common. After I've started to draw with 101 Dalmatians, it went through different Animes to my own stories and finally to TLK. Especially the gigantic fandom and its great Fanarts here on TLKFAA have animated me. (With some artists I still admire today, I've made friends and I've learnt a lot from them! Thank you!! :) 1 ½ years ago I've uploaded my first picture and I'm still trying to develop my own style and to improve. What promotes me mostly is my comic "The Lionking -Hidden Stories-". Everything has started with the wish about a story of Kopa. I've searched everything and have read what I could find about TLK and so I developed my story. It's incredibly much fun for me to work on my comic, to improve the sketches, to set the colors and to design the backgrounds. However, without so many fans who read and comment my story I would never have reached this number of pages. Well ... so much about myself! I will continue to draw in any case and work on myself and thank you for the honor of the AotM. Also thanks to you Brian! A very special thank you to my friend Kari who visited me for a week and did a great TLK-workshop with me! I gave her some hints with colored pencils and she explained Photoshop to me! MANY DEAR THANKS TO EVERYBODY WHO SUPPORTS ME!! It's no wonder why so many people are drawn to kati-kopa's art: it's simply magnetic. Just looking at one or two of her lusciously colored, richly detailed pieces, you can't help but look at the rest—they're just downright good-looking pictures. kati-kopa has mastered the skills that the artists of the Disney tradition learned decades ago to exploit: if you make appealing-looking characters and drawings that are just plain fun to look at, you'll captivate your audience. And that's what's happening here. Whether standalone canon tableaux or pages from her long-running comic, whether real media or digitally colored piece, the inherent pleasantness and appeal of kati-kopa's characters shines through. This is especially apparent in her renderings of canon characters, particularly those that don't traditionally evoke a "cute" reaction: Scar, Zira, Zazu, even the Hyenas take on a new, tactile aspect in her hands, a transformation to a more benign and approachable form. 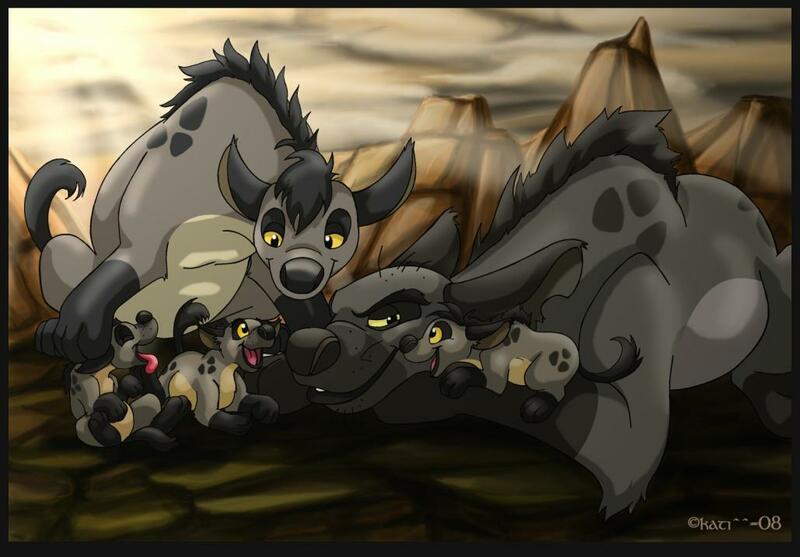 Even her characters that are supposed to be rough-necked and gritty (the three Hyenas' father, in one example) retain a certain undeniable charm that just makes the whole scene depicted all the more immersive and artistically successful. On the subject of technique and media, kati-kopa shows a willingness to experiment and avoid formulaic presentations, whether she's using real media such as colored pencils, or a digital canvas such as Photoshop. Her more detailed landscapes tend to appear in the digital works, but I think it's actually her real-media pieces that retain more of her signature charm. The soft linework and the grain of the paper reflected in the color regions contribute to an immediacy and a presence that makes the art feel more genuine, more spontaneous. Real media even offers more versatility in a lot of ways than a digital tablet does; linework is free to dissipate at the fringes, lettering and captions keep a free-form and hand-crafted quality, and there's an overall touchable, storybook-like feel to the whole composition. Not very many of the really prolific artists these days work in physical media at all; Photoshop, after all, makes so many parts of the creative process so easy that it quickly becomes indispensable. But kati-kopa has persevered in pursuing excellence in all forms of media, not just the digital ones; and the result is a clearly well-rounded artistic talent, one that can go in any of several directions whenever the need should become apparent. kati-kopa has fewer than 200 pictures to her name in her gallery, but it's clear that she makes the most of each one in her effort to improve artistically; each piece is significantly different from the last, in subject matter and composition and style, and shows an artist not willing to rest or get comfortable with any formula, no matter how successful it might be. kati-kopa is driven to create, and she's got stories to tell, even if it means inventing a new skill or technique at every step of the way, while we watch in appreciation. Congratulations to kati-kopa for her achievement!